Honey from all around New York City. This article is one of a series I’m writing as a Visiting Artist at BLDG92 in the Brooklyn Navy Yard. 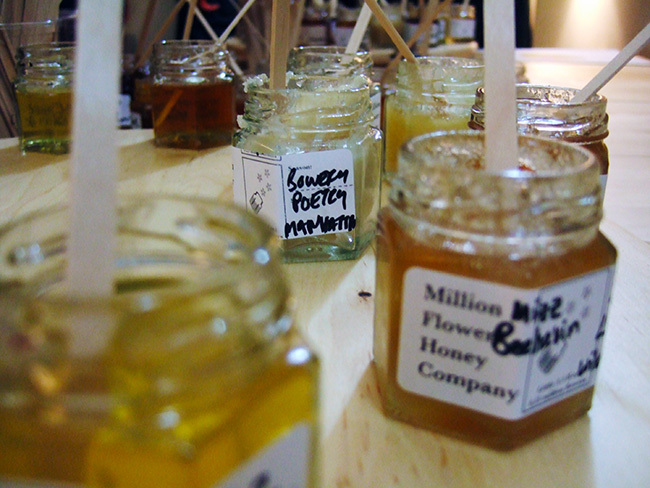 Last fall, a few weeks after Hurricane Sandy, I attended a honey tasting in Brooklyn. Signs of the hurricane were still everywhere, and it felt nice to be doing something normal. If attending a honey tasting can be considered normal. The tasting was hosted by Tim and Shelly, a beekeeping couple; like the honey they produce, their love is strong and sweet. They got married this month, with homemade mead in the wilds of Ohio. When I arrived at their Brooklyn apartment, there were more beekeepers in the living room than I had met in my entire life. And the honey spread was unmatched by anything on earth. Six continents were represented in honey samples (all except Antarctica), dozens of countries, and a jar of honey from almost every state in the union. But most incredible was the entire lazy susan devoted to honey exclusively from the five boroughs: Manhattan, The Bronx, Queens, Brooklyn, and Staten Island. A change in legislature made beekeeping legal in the city a few years back, although many New Yorkers kept hives illegally for many years before. They dot the roofs of the city, nestle in the back yard,s and in some places, large apiaries have been established, like at The Brooklyn Navy Yard. “But bees are also really lazy,” she added. Take the infamous Red Hook Red. In Red Hook, Brooklyn, a mostly industrial (but rapidly changing) neighborhood, there’s a maraschino cherry factory. It’s cobbled together from a couple mismatched structures like many small factories in the city: as the factory it expanded, it bought several unattached buildings on the same block. As batches of cherries were moved from one space to another, sometimes some of that candy apple-red sugary liquor was spilled and little puddles of cherry syrup were common. Red Hook Red, made from the blood of maraschino cherries. A nearby beekeeper pulled out his honeycomb one day to discover hundreds of hexagonal pockets of deep red honey. He was horrified, and puzzled, until the mystery was solved: instead of seeking the nectar of flower blossoms, the bees had discovered a nearby and readily available source of sugar, the maraschino cherry factory. I always thought Red Hook Red was urban legend. But there it was, at the tasting, in all its rust-colored glory. The flavor was not as bad as you would expect, but not like something you’d want to eat again. “I’ve found pockets of blue, green, orange…” Shelly said about her honeycombs. “They just go to the trash can and sip Gatorade.” The hazards of urban beekeeping. There were also three jars of honey that were truly special, because they could never be tasted again. They came from Red Hook, the Rockaways, and the Brooklyn Navy Yard: from three hives that were swept into the ocean by Hurricane Sandy. 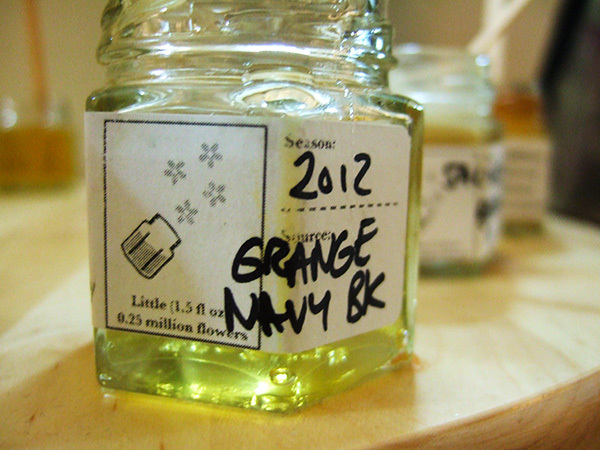 Honey produced at the Brooklyn Navy Yard, shortly before the hive was destroyed by Hurricane Sandy. When I sipped these honeys, I thought about how these bees had been connected to my city. This relatively small loss had the power to suddenly make me feel connected to all the much greater losses my city had suffered. And when I think of these sweet little honeys now, I wonder what this hurricane season will bring to the five boroughs. 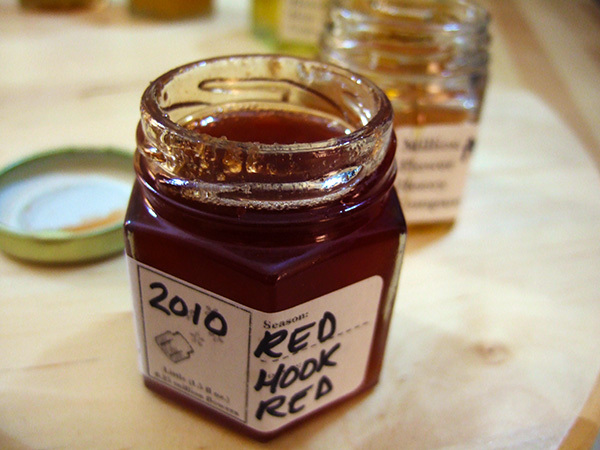 There’s a terrific chapter on NYC beekeeping, and the full story of “Red Hook Red”, in Robin Shulman’s new book “Eat This City”. I forgot I have that as an ebook! I’m going to read it. what an amazing experience. I’m a honey lover (and I can never imagine anything being as delicious as our local honey) so this pretty much sounds like heaven to me. Coincidentally, I was at the wedding in Ohio (such fun to open up Feedly, start reading, and realize that I knew who you were talking about!) and tasted the mead. Pretty good stuff, and I’ve tried a few commercially produced meads that were nowhere near as nice. I love the measurement in flowers on the side of each jar. That’s so funny! And sweet. Although no pun intended. I had some of their mead in the spring and it was excellent. And ohio weddings are the jam. I had a busted down car and was stuck in new york, but it looked magical on facebook.